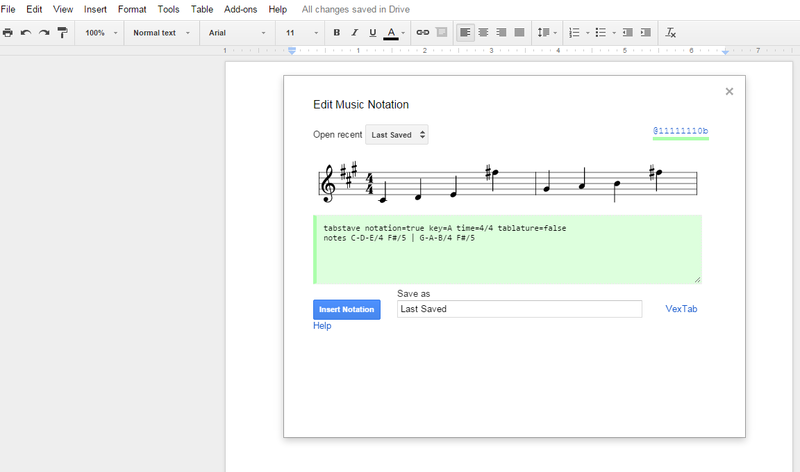 VexTab Music Notation is a Google Documents Add-on that lets you write music notation in Google Documents. With the Add-on installed you can write standard music notation, drum notation, and guitar tablature in a Google Document. To do this simply open the Add-on from your Add-on's menu, select "insert VexTab," then start writing. When you have finished writing a segment click "insert notation" to add it to your document. The inserted notation appears as an image in your document. Click here for a tutorial on writing VexTab notation. VexTab Music Notation could be a good Add-on for students in a music theory course who have been asked to write a few bars of music. The Add-on could also be useful to teachers who want to create some sample music as an instructional aid.